The Schoolhouse is in the redwoods, but when we bought it it was IN the redwoods – literally – with too-big trees pressed up against it front, back, and sides. We took down a few and then a few more, both to make room for the decks and to let in some light. 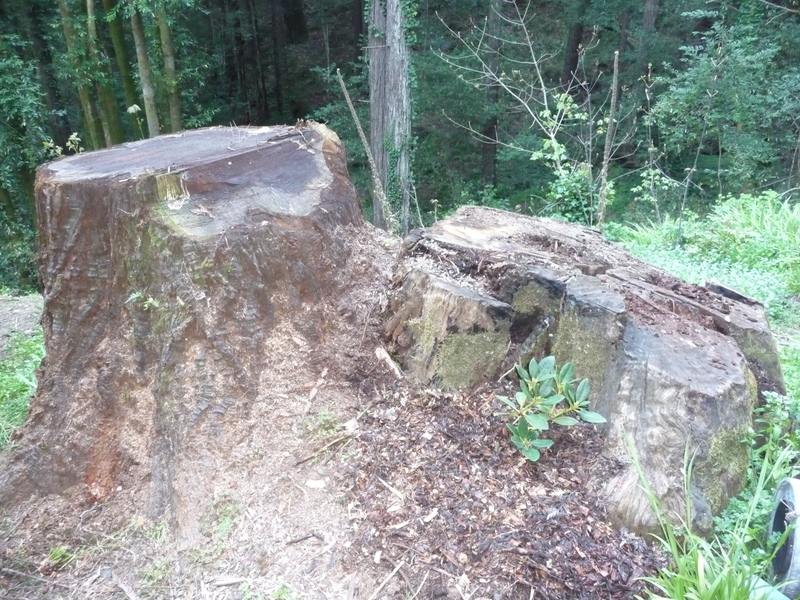 Several of the stumps are under the decks but there are two in back – one old and one new – that were kinda buggin’ me. 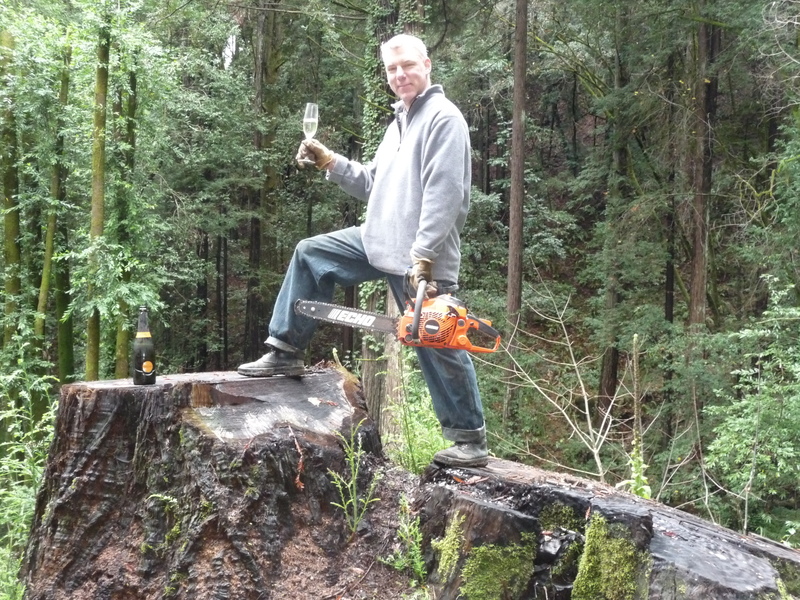 In Calaveras Big Trees State Park, there’s a stump so big it was used as a dance floor in the 1920s. These, thankfully, are not that big. They’re not even big enough to put a picnic table or a hot tub on – they’re about 3 feet across, maybe 4. We used one of the stumps as the prop for the New Year’s card my husband sends to his customers and every few months he gets out there and chops off all the little sprouts they put out around the base (redwoods are nothing if not tenacious, which is probably how they’ve survived since primeval times). But other than that they’ve just been sitting there. Looking at me. No matter how much you might wish they weren’t there, they are, so I felt I had no choice but to turn them into a landscape feature. The new one is still really solid, so there was nothing to do there except maybe put a gnome or two on top of it. The old one is really cool. It has all kinds of places that are half rotted and soft. So after planting a rhododendron in front of it my first move (of course) was to take a grub ax and start chopping away at it to see what would happen. 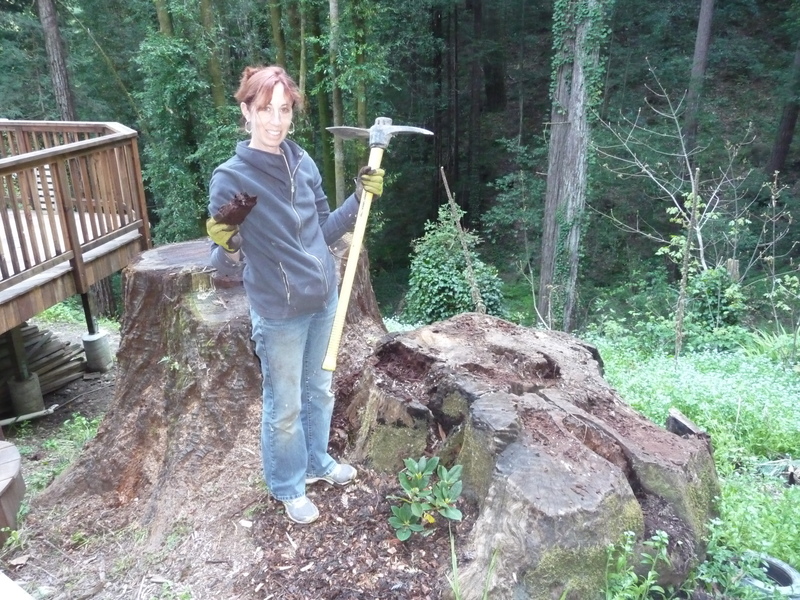 I managed to chip out quite a few nooks and crannies and only injured myself once (my takeaway: when using a grub ax to chop rotted wood out of crevices and crannies in a redwood stump, do not get your finger caught between the grub ax and the hard part of the wood. If you do your glove finger will fill with blood and it will take weeks to heal). The next challenge was planting. 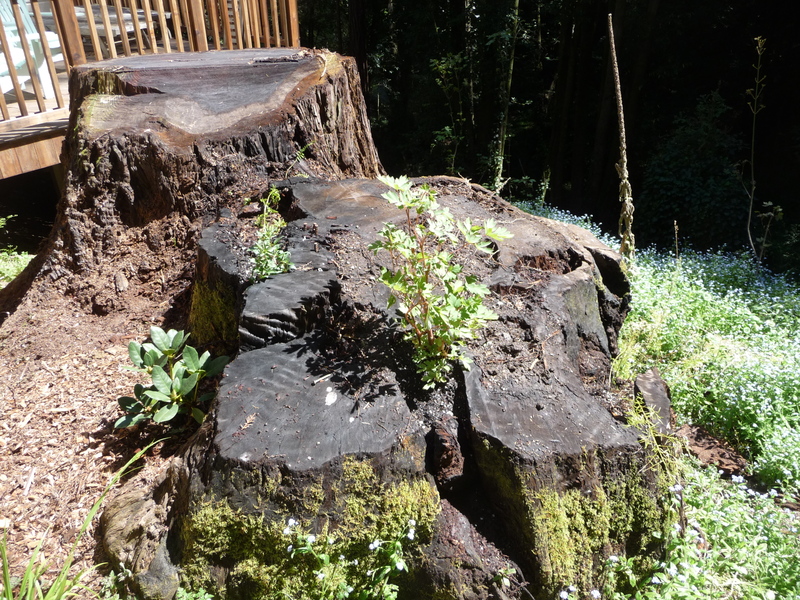 The stump sits in a spot that gets NO sun at all for four months a year but during the summer gets several hours of direct sun, and the direct sun in Sonoma County is HOT. So planting is kind of an experiment. I filled the crevices with planting mix and started with a few ferns and other plants that I transplanted from the wild. Then I added some forget-me-nots and a couple of leftover asparagus ferns from the Chris and Todd windfall. Then I added a fuschia and a bleeding heart. I still have a few more crevices to go. 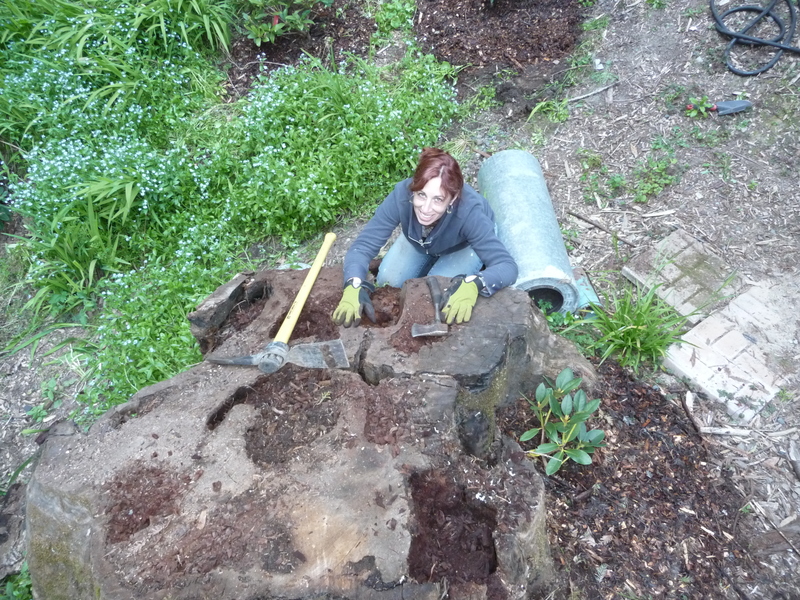 Any suggestions for what will grow well in a redwood stump that gets hot sun a few hours a day? Garden in a stump, in the sun! Beth- I never knew you were a blogger or an axe-wielding gardener. Very fascinating. You all are always one step ahead Eric, at least! this is great to see! We are going to fell a dying tree smack dab in the middle of my little planting area…now I know what I can do with the leftover stump! no gnome! If you are open to annuals, you could try geraniums or even basil. Or, if you really just want to cover up that stump, plant oregano or mint and you’ll never see it again. Ever.